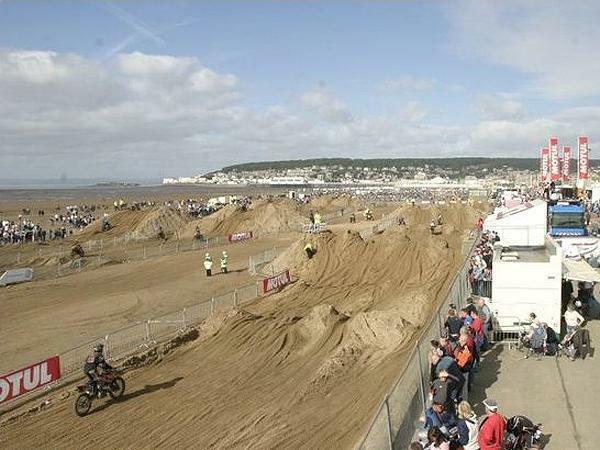 The 27th running of the Weston Beach Race was cancelled today, following a major incident on the main straight involving more than a dozen riders. A collision within the main pack, as the competitors headed away from the start and up the main straight, led to a chain of events that resulted in a number of riders falling from their machines. The onsite medical teams were quick to respond to the incident and treated a number of riders on track before transferring them to hospital. In response to the incident the race was immediately halted, to allow the medical services continued safe access to the track. In all, 17 riders were transported to hospital after the incident, where they were treated for their injuries. One rider sustained more serious injuries in the crash and was subsequently transferred to Frenchay Hospital in Bristol, where he is currently undergoing evaluation by medical staff. With the majority of the medical teams committed to transporting the injured riders to hospital, race organisers took the decision to cancel the event in the interests of both rider and public safety. Gareth Hockey, Director of RHL Activities Limited who promote the event said: "It was immediately obvious that the crash was a serious one and that a number of the injured riders would require medical attention on the track. "As a result there was no hesitation in stopping the race to allow the medical teams safe access to the injured riders. “Unfortunately, one of the riders involved in the crash sustained serious injuries. "At this time we haven't received any additional information as to the extent of these injuries, but he is currently undergoing medical treatment in Bristol and we are obviously hopeful that he will make a full recovery."